My sewing machine (whom shall remain nameless) - Stop staring and start sewing! It's Sewing Machine Month over at Sew Mama Sew! so I though I would join in and answer their questionnaire. 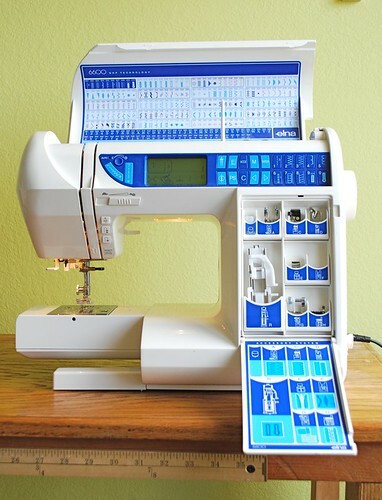 There are some great resources on all aspects of sewing machines (buying one, attachments and accessories, choosing the right needles, etc.) on her blog all month so it's definitely worth checking it out! Here's my machine and answers. What brand and model do you have? How long have you had it? Elna 6600 Quilter's Dream 2. I've owned it for about a year and a half. Mostly clothes and handbags. Occasional quilting and home dec. Lately I've been sewing about every other day. My machine doesn't get nearly as much use as I'd like. I'm sure I haven't even begun to tap it's full potential. I really like my machine! It's solid and durable and has lots of fun bells and whistles. It doesn't have a name (I guess we haven't completely bonded yet). I really like the needle threader since my eyesight is kind of going downhill. I like all the fun stitches and I really like the fact that the stitch length goes up to 5 (my old one only went to 4). Oh, and I like the lever attachment that lets me lift the presser foot with my leg so I can have both hands free. I like the button holer but it makes the button holes too long so I just put a smaller button in the attachment and it does fine. The computerized stitch codes are a little intimidating sometimes but I keep the instruction book within arms reach at all times. I bought it on a lay-away plan and it took me about 7 months to pay it off. 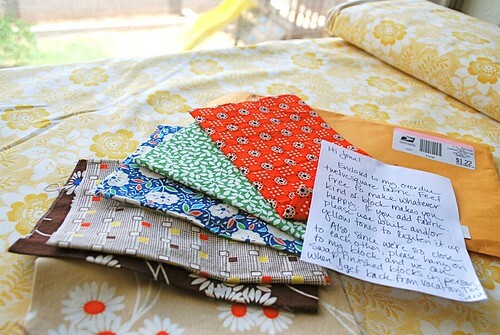 I sewed like crazy, selling boutique clothes on ebay to finally bring it home. It was my gift to myself but I really worked hard for it and when I finally had it I was so happy (still am!). Yes! 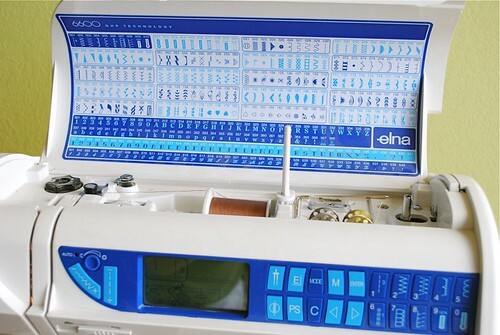 I'm very happy with the Elna brand and it's a smooth humming machine. It's easy to use and solidly built and I hope to get 20 years out of it before handing it over to my future granddaughters. Quality, quality, quality! I always recommend people buy a used high quality machine over a shiny, new cheap one. I think it's always smart to buy from a local dealer because they usually have classes and quick turn-around time on tune-ups and repairs. I also think it's good to support small business owners (Walmart and Sears will get by just fine without a little of your business). I wouldn't mind having a totally pimped out Bernina but frankly I'd pay 5 times what I paid for mine and still wouldn't use all of the options so I'm very content with my machine. I can justify 1300.00 to my husband but it might be a stretch trying to convince him I need to spend 8000.00! And I finally put together a quilt block for Kathryn! It took me about 2 months to get around to it and about 45 minutes to create it from start to finish. I'm pathetic. Anyway, I think it's cute (I hope she does!) 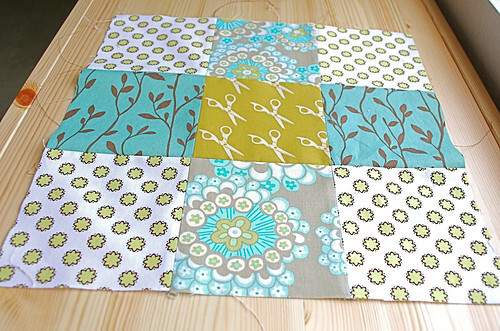 and I'm really happy with the snip snip print in the middle (I think every quilter needs a little of that print). And I received the ingredients for Sarah's block this week. I really love all these spunky prints and she asks us to add yellow or white if we want to add a little of our own. I think this Fiona print by Anna Griffin might be nice because it's soft enough looking to not clash with the prints in her stack (if I'm careful to not use too much of it). She lives up in Scottsdale so she wants me to hold onto it until we can exchange our blocks in person. That will be fun!! I love meeting up with bloggers in real life!